Adelaide sounds regal and vintage, a sister for Eleanor, an alternative to Charlotte. The Germanic Adalheidis gave us the stylish Alice and the homespun Ada, spunky Heidi and sweet Adeline. Or at least, they’re all cousins, found on the same family trees. It comes from the elements adal – noble – and heid – type. So girls by this name are the noble kind, high-minded and perhaps a little bit privileged, too. That’s exactly what the name sounds like, too. Plenty of early bearers of the name were born to the tiara. 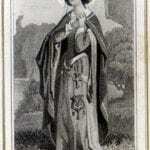 Adalheid von Burgund was born in 931. She married the King of Italy; after he was killed by his rival, she refused to marry the son of her husband’s assassin, and fled instead. Eventually she married again, this time becoming Holy Roman Empress. She’d eventually serve as regent for her grandson. Because she used her position to help the poor and build churches, the dowager empress was eventually recognized as a saint. Her life story inspired operas by Handel and Rossini, and Judy Chicago included her in the art installation “The Dinner Party,” a work about the important women of history. 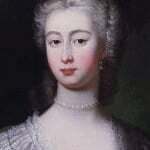 More noblewomen and princesses followed, including two queen consorts of France. Here’s the game-changer: in the nineteenth century, King William IV of the United Kingdom married a German princess called Adelaide, and the name caught on with English speakers at last. Sure, she reigned. But she also proved quite popular. Adelaide was known for her grace, her generosity, and her devotion to her faith. The monarchy was in a bit of a muddle, with a decided lack of heirs. None of the royal couple’s children lived more than a few months. William was ultimately succeeded by Queen Victoria. It’s said that the childless royals were always kind to their niece; indeed, Victoria’s firstborn was named Princess Victoria Adelaide Mary Louisa. The name has been in use in the royal family ever since. The good queen also inspired the name of the capital of South Australia, founded in 1836. That puts this name on the map, just like Brooklyn and Savannah. With so many place names in the US Top 1000, the tie to the Australian city can only bolster the name. It may be that the queen inspired parents, but we can’t known for sure. She died in 1849, a dozen years after her husband died and Victoria ascended the throne. When the US rankings were first established in the 1880s, it appears that Adelaide was already falling. By the 1940s, the name had exited the Top 1000 entirely. In 2005, the name returned. As of 2016, it was up to #258. That seems impressive, but consider this: Addison, Adeline, Adalyn, Adalynn, Adaline, and Adelyn are all far more popular. The rise of Addie names – which followed all those Maddie names – probably deserves credit for some of this name’s resurgence. Whether that’s a problem or a plus is up to you. Addie will get lost in the crowd. Despite that, Adelaide remains a style stand-out, a name that few other names resemble too closely. If you’re looking for a name as classic and flexible as Elizabeth or Katherine, but slightly less common, this could be the perfect choice for your daughter. What do you think of Adelaide? Do you like another Addie name better? And Australian readers, tell me – is this too wedded to the city to be used as a child’s name there? 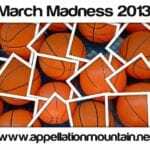 This post was published originally on November 10, 2010. Following substantial revision, it was re-posted on February 28, 2018. I love the name with the nn Ada, but have the same question regarding it being a place name. We are from Adelaide, Australia and while not currently living there, will likely move back at some point. Does that rule it out for us? We aren’t sure and feel like friends and family would be biased if we asked. We would likely call her Ada, but like having the formal name that gives her more options as she gets older and the connection to our hometown is kind of nice. But perhaps weird if we move back? Would love to hear others thoughts. My daughter Adell was born just one day before this article was reposted, so I’m definitely partial to that Addie name! Although her nickname is Baby Dell, as our two year old son calls her. Adell is a family middle (hence the uncommon spelling) that made it’s way to the first name spot. Poor thing went nameless for two weeks as we tried on and rejected all our top names, until we realized that Adell was meant to be her first name. I don’t like it- laide means ugly in french. Also- I read recently that Adelaide was the most popular girls name in Idaho right now in a post about most popular names by state… Not sure if this is accurate but I found it interesting. Adelaide Elizabeth is a darling one-year-old in my extended family. Her nickname is Della (aDELAide), which sets her name apart from all the Addies. I like the history of the name Adelaide and the uniqueness of using Della as the nickname. I’ve only come across that combination once or twice online. On Della- one of my daughters is named Delphine and we sometimes call her Della too! Huh, did the rest of this entry disappear? All I see is the bit up to Heidi. I have a 9 year old Adelaide, also named after my great-great-grandmother, who was a schoolteacher. My mom inherited some of her books, and I loved her signature in the fronts of those books growing up, and copied the way she wrote her initial “A” for my own name, Amy. When we hit on this name as a suggestion when we were expecting, there was no longer any contest for a girls’ name pick! (Though, to go with Marmalade, my older daughter, Rosemary, on first hearing her name, thought of “Lemonade.”) And we’re great with the Addie nickname, too, though my daughter prefers it with the “y” ending, “Addy.” We have been surprised to hear the gaining popularity, as well, but think it’s well-deserved. And we only know one baby Adelaide so far (at our congregation), and have heard of one other baby in the last year or so. Oh, I love that idea. It is a subtle tie to your name AND your family history, too! You were WAY ahead of the curve, Marvy! Great name – and Marmalade is a fun nickname. Adelaide was on my list of names for Roseanna — the list that Mark sadly didn’t like. I included it on there because I find the name beautiful and also because Heidi is a family name. When we decided to name our daughter after Mark’s mother I insisted that I choose the middle names. Adelaide came up again, as did Adeline (not on the original list). We decided to go with Adeline for the sake of flow. Rachel Griffiths (Australian actress of 6 Feet Under and Brothers & Sisters fame) has three kids with very Australian seeming names: Banjo, Adelaide, & Clementine. I love it as a sibset! I like Clementine, but way out west the song just seems so dreary. I love Matilda, too — but that song is depressing as well, although a very sweet sound to it. Nice addition, Liz. I always remember the daring Banjo, but her girls’ names really are lovely. This is why I’ve chosen Adelaide as my middle name. I didn’t have on before, but I do now. It’s to remind me of my worth, and of the fact that Heidi was once part of my life and that she shaped me into much of what I am today. Not by making me like her, but by making me understand that I need to be as little like her as I possibly can. I live with that, proudly. That said, I could never use the name Adelaide for one of my own children, regardless of how much I love the name… Naming one of my children ‘after her’ would be horrifying. Also, my favourite nickname for Adelaide is not in any way ‘Addie’, but ‘Lady’. Adorable! That’s a powerful association, Dearest – too much for a child, but a meaningful one for yourself! I really like the Ada names, but Adelaide is probably my least favorite. I’m glad that other parents are rediscovering it, but I think the -laide element sounds tight and unyielding in my accent. My second cousin named his daughter Adalyn, I would have been positively giddy if they had picked Adelaide instead. Adelaide doesn’t really excite me. It says “Australian place name” to me – which would be nice if the place has meaning to you. Plus it kind of blends in with all the Addie- type names, especially making me think of the Addyson and the Addisyn that I know of. I do somewhat like Ada and Adele though. 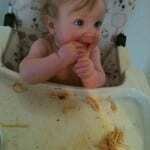 I did think about Heidi for our 2005 daughter – not having known anyone with that name was a plus for me. Wasn’t quite the right fit for us though. The very first time I heard this name was in the play “Guys and Dolls.” So when I hear it, I think of musical theatre. Which isn’t necessarily a bad thing – I do love musical theatre – but it is a distinctive connotation to me. Absolutely detest it with the burning fire of a twillion suns. BUT, I adore Ada (sounds comical with surname) and Alice (bad, bad, bad association). Adelheid is nice too in a GP sense. Funny little anecdote ApMtn; I had a dream recently that you reviewed the name ‘Boring’, concluding with ‘The combination of pleasant sounds make Boring a winning choice for a boy or a girl’. It did make me laugh when I remembered the next morning! I really like Adelaide. I am not, however, fond of the Addie nickname. I like the idea of using Adele as a nickname. Adelaide is so pretty, and I would hate for it to be confused with the more popular and less pretty (in my opinon) Addison. I would use it in a hearbeat, as long as it doesn’t get to popular. 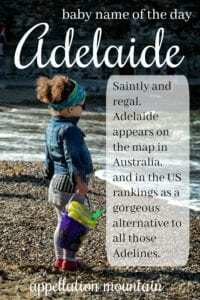 I absolutely love the name Adelaide! Beautiful, dignified, has an acceptable nickname. I also love all the offshoots of this name – Adele, Adela, Adeline, Adelina, Ada. I even saw Adeliza hundreds of years ago in the family tree of the British monarchy. When my great-grandmother emigrated to the US from northern Italy/southern Austria (now Slovenia), she brought her youngest child and only daughter (at that time) with her – Adele. Sadly Adele got very sick and perished on the ship during the voyage. She was buried at sea. Such a sad story and but a great way to honor my family history with this beautiful name! I know of two people I graduated with who have named their daughters Addison – I MUCH prefer Adelaide by far! […] immigrants in the 1400s. […] Betty Crocker was created by a woman named Marjorie Childs, and was portrayed by an actress named Adelaide.